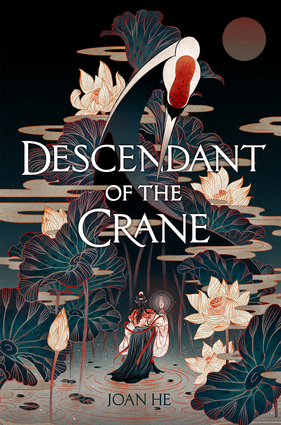 "Deep world-building, magical family secrets, and intricate palace politics—Descendant of the Crane soars from page one. Its twists and treacheries kept me guessing until the very end. "—Rachel Hartman, New York Times bestselling author of SeraphinaTyrants cut out hearts. Rulers sacrifice their own. Princess Hesina of Yan has always been eager to shirk the responsibilities of the crown, but when her beloved father is murdered, she's thrust into power, suddenly the queen of an unstable kingdom. Determined to find her father's killer, Hesina does something desperate: she enlists the aid of a soothsayer—a treasonous act, punishable by death… because in Yan, magic was outlawed centuries ago.Using the information illicitly provided by the sooth, and uncertain if she can trust even her family, Hesina turns to Akira—a brilliant investigator who's also a convicted criminal with secrets of his own. With the future of her kingdom at stake, can Hesina find justice for her father? Or will the cost be too high?In this shimmering Chinese-inspired fantasy, debut author Joan He introduces a determined and vulnerable young heroine struggling to do right in a world brimming with deception. Joan He is a Chinese American who grew up reading many of the great Chinese epics and legends, from which she draws inspiration for her debut novel. She lives in Pennsylvania.